Sending the same message content over and over? Using message templates in MightyText will save you lots of time. Message Templates can be created in both the MightyText web or tablet apps. Navigate to the Templates/Signatures pane under the Settings tab. In the Templates/Signatures pane, you will see templates you have already saved (if any exist) and a button to create new ones. When you create a new template, you will be asked for a template Name and Body. 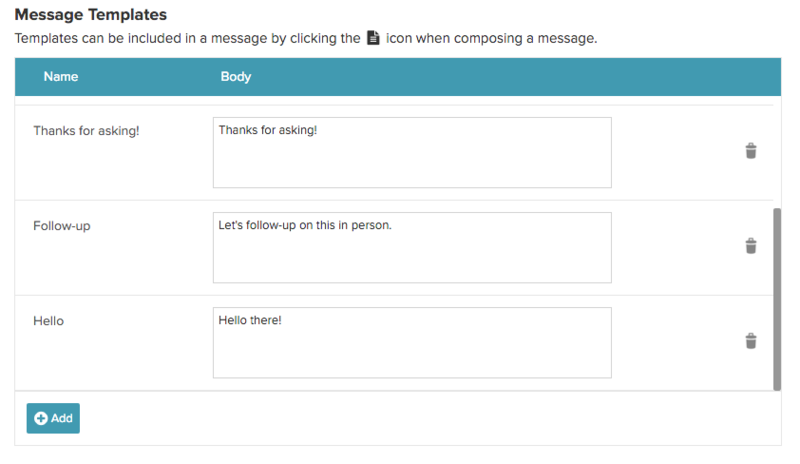 The "Name" field describes your template and the "Body" is what is sent when you add a template to a message. You can also save templates directly from any response area. Click the Template/Signature button (above the send button) and select Save as template from the menu. The message body that you have drafted in the response area will be saved as a new template. After clicking the Templates/Signatures button, you will see a list of templates organized by template name. Clicking on any template name will automatically fill the message reply area with the template body content. It’s that easy to send templates.